1. Prepare your favorite spaghetti or marinara sauce; set aside. 2. Preheat oven to 325 degrees F (165 degrees C). Grease a deep 9×13 inch baking pan. 3. Shred zucchini using box grater or food processer. Using a clean kitchen towel or cheese cloth, squeeze the zucchini as dry as possible; set aside. 4. Meanwhile, stir egg, ricotta, and parsley together in a bowl until well combined. 5. To assemble lasagna, spread 1/2 of the meat sauce into the bottom of prepared pan. Then layer 1/2 the shredded zucchini, 1/2 the ricotta mixture, all of the spinach, then 1/2 the mozzarella cheese. 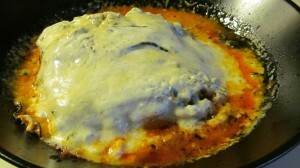 Repeat by layering the remaining meat sauce, zucchini, ricotta mixture, and mozzarella. Spread Parmesan cheese evenly over the top; cover with foil. 6. Bake for 45 minutes. Remove foil; raise oven temperature to 350 degrees F, and bake an additional 15 minutes. Let stand for 5 minutes before serving.